« Do you have experience of Palliative Care services? 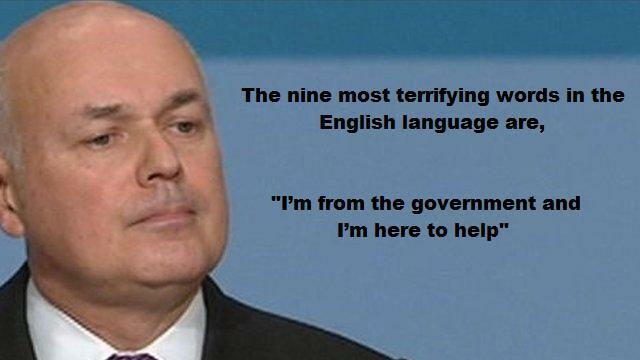 The Nine most terrifying words in the English Language are…. Benefits Street arrived on the iPads of Telegraph readers on Saturday night. A story about scroungers refusing help to get back on their feet and the Conservative party’s proposed “tough love” solution provoked strong reactions. And that’s no surprise. People with mental health problems who are unable to work and dependent on state support were led to believe that payments would be docked if they refused treatment. This would effectively make state-sanctioned treatment compulsory on pain of losing your only source of income. Telegraph readers were fed the line that people with common mental health problems were willfully refusing to engage with treatments almost guaranteed to succeed just so that they could lounge about at taxpayers’ expense; but reassured that the Tories had proposed a simple and cost-effective solution (sanctions and compulsory treatment) to get people back to work. Although at first glance the story might follow a coherent line, at second glance it became clear there was more to it. None of the reasons for publishing the story (see below) had anything to do with the advice of mental health professionals nor with helping people with mental health problems back into paid work: people with mental health problems are being used as pawns in a game of politics. This entry was posted on 15 July 2014 at 12:38 and is filed under mental health. You can follow any responses to this entry through the RSS 2.0 feed. You can leave a response, or trackback from your own site.